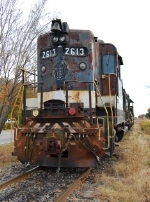 Description: ex-Southern 2613 delivers coal to Grainger steam plant. Description: exSouthern GP30, on the other side of the Parking Structure is the beach and ocean! Description: Ex Southern GP30 still shows it paint scheme as Carolina Southern 2613 backs on the spur with a car load for 84 Lumber. Description: Carolina Southern GP30 2613 at Chadbourn Departing with coal train. Description: Carolina Southern near the the CSXT interchange. 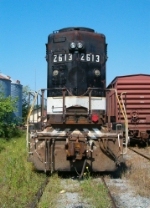 Description: The heavily scarred face of Carolina Southern GP30 2613 is detailed at Mullins SC. 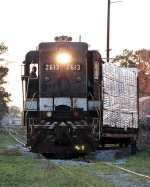 Obviously a former Southern unit, it also carries the weathered herald of the Waccamaw Coast Line on its nose.